Who Do You Love? is an exceptionally cute and special book that would be ideal for any young child – boy or girl – despite its very pink cover! On a recent visit to the library my six year old daughter picked it up to borrow along with a number of others, and it was this book that she wanted to read first. In fact I first really appreciated what this lovely book was like as I drove home from the library and overheard her reading it to her younger sister! There are not many pages in this book and there is not that much text on any one page, but what it does say and the message that it provides is very sweet. 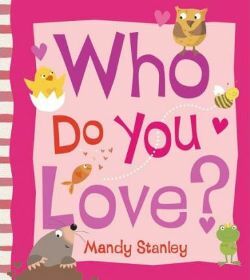 Each page features a different small creature and at the top of the page that creature is always asked the same question – ‘who do you love?’ followed by that creature’s name. Most of the page is then taken up with a bright colourful picture and underneath that is each creature’s response. These are quite varied but all very loving. For example, the chick says that he loves his baby brother and sister; the flamingos claim that they love each other; the bees love Her Majesty, the Queen (now there’s a surprise!) and the goldfish loves the boy that feeds him! My girls love all these varied responses and some of them – such as the bees loving the queen – provide some quite interesting talking points. Ten animals are asked the question all together and the final one asked is an owl. His answer is to another owl to whom he says ‘I love YOU-hoo-hoo!’ which is quite an amusing take on the owl normally saying ‘twit-twoo’. After that there is one final question which seems to be addressed to the reader so right at the end the child can say who they love too. This is a lovely idea for a book and actually gives you quite a warm cuddly feeling as you are reading. The illustrations fit in perfectly too and these are bold and colourful with a small hint of humour too. The girls love looking at these as they are reading. When my daughter chose this book, my first thoughts were that it was probably too easy for her but on reflection I really don’t think that this matters. Even though she is a fluent reader and the words are pretty easy, she enjoys reading it and that is very important. Also, as the text is quite repetitive, her younger sister (who is just starting reading) is able to start joining in and her older sister is quite proud to be helping her with her reading. It will not take long to read this book but it will probably be one that they want to keep coming back to. It has a lovely theme about relationships and there is a lot to talk about on all the pages. We all think that it is great! No Comments on "Who Do You Love?"